Why do we like the music that we like? What makes us avoid listening to certain types of music? I've explored these questions in previous posts, but still the topic continues to be worth consideration. Next Monday (September 5th) I'll be contemplating these thoughts with my next Question of the Month post. But first comes a Battle of the Bands post that is the beginning of the views that I'll be expressing in that Monday post. In this round I'm using a song that will be likely unfamiliar to most of you and this is probably because you don't listen to this type of music. Though there have been some big chart hits in the United States, Canada, and United Kingdom that were in a language other than English, it's certainly not the norm. Many music fans like to understand what the lyrics are saying so they are often turned off by music in a language they don't understand. Then there are those like me who typically don't pay much attention to lyrics--at least not on first hearings--and instead take in the feel of the music. For me lyrics are secondary to the sound of the music. There are many songs that I can sing through the first line or two and then I'm lost. Perhaps it seems odd for a person who enjoys writing not to care about the lyrics. In my case that's just the way it is. If a song consisted of nonsense syllables then I might not like that so much. I want a song to be saying something, but I don't always care much about what it is saying. There are songs that I have listened to and enjoyed for many years and I still don't know what the lyrical content is about. And that's fine with me as long as the song sounds good to my ears. In the year 2000 when I was frequently listening to one of the popular Los Angeles Spanish language music stations, a song that began to receive frequent airplay caught my attention. "El Listón de Tu Pelo" ("The Ribbon in Your Hair") initially struck me as somewhat comical sounding with its banda cumbia fusion. Punctuated by flourishes of a mariachi-like brass section with an infectious percussive background that makes one want to move in rhythm to the music if not actually get up and dance, the song caught on with me. There was something about the plaintive vocal trade-offs between the male and female singers. I didn't have much idea of what the song was about, but the sound of the music was appealing to me. I found the song to be a catchy tune that inspired me to purchase the album. Fast forward to the present time when I happened to run across this song again on YouTube. Los Angeles Azules--or The Blue Angels in English--had been collaborating with other well known artists as well as symphony orchestras in covering their own hits. I was blown away by these performances. The song that had captivated me some 16 years earlier was again on my regular playlist. And not only were there the new covers of "El Listón de Tu Pelo" that I found but another cool version by a popular Latina female rocker. 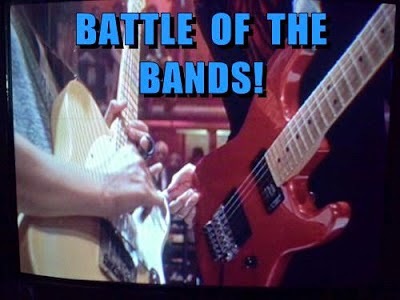 To me this seemed like an ideal pairing for another Battle of the Bands contest. For reference only here is the original version of the song. DO NOT VOTE FOR THIS VERSION! If the video is restricted in your country you can try this link. Besides being a very attractive singer, Julieta Venegas is an incredibly talented songwriter, producer, and instrumentalist. Venegas was born in Long Beach, California, but grew up in Tijuana, Mexico where she started her musical career at a young age eventually joining various rock groups including the influential Tijuana No!. In 1997 Venegas embarked upon her very successful solo career. She has won several Grammy awards and written music for theater and movies. Her many musical collaborations include her cover of "El Listón de Tu Pelo" with Jarabe de Palo, a rock group from Spain. Try to listen to this with an open mind as the initial rap/hip-hop sounds might be a turn off to some--it was for me. The recording does get better with the Latin percussion and some funky singing that retains the cumbia flavor of the original while keeping the sound fresh and updated. But you decide with your own ears. This version is actually by the original group Los Angeles Azules who are joined by a small symphony orchestra, a choir, and singer Denise Gutiérrez who is the vocalist with the Mexican alternative pop band Hello Seahorse!. Denise was born in Van Nuys, California, but raised in Mexico City. This video is one of many collaborations with orchestra and well known Mexican artists. These videos are pretty incredible and I've been watching (or listening to) these repeatedly over the past few months. Hope you've enjoyed this music that might be new to you and perhaps a bit alien sounding. Maybe it's not your style of music, but hopefully you'll keep a musically open mind in assessing the two versions. Let us know what you think about these two recordings. Is there one that you prefer over the other? 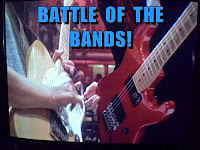 If you're visiting a Battle of the Bands post for the first time then let me briefly explain. Please give each song version a fair listen to decide which one you enjoy the most. If you don't like either then at least tell us which recording was least innocuous to you. This comes down to your preference and it's as easy as that. Since I'll be posting on Wednesday the 7th for the Insecure Writer's Support Group, rather than do too many posts next week I'll merge my BOTB results into the IWSG post. Add to that my Question of the Month post on Monday the 5th and I've got a busy schedule according to my posting habits as they have become. Please join me for these posts. Do you pay much attention to song lyrics or do you typically just absorb the musical experience? Is listening to music in a language you don't understand a turn-off to you? What is your favorite pop/rock music collaboration with orchestra? Your version of the second group with the orchestra did not open for me. GEMA had something about the rights not being given but I took the time and did find a version with orchestra by Denise Gutierrez. However, I have to admit that the first with Julieta Venegas, is in my opinion, the best. It has life and force in it. By Denise's version, I could have fallen asleep. So my vote is for JULIETA VENEGAS. Pat, Thanks for seeking out a version you could listen to. I like the energy of Julieta Venegas' version best. Alex, I feel like I need some energy this morning. You and I share a similarity. While words are very important to us in writing they are not as important in recorded music. There are many recordings that I have listened to and loved for decades w/o knowing the exact words. In fact I prefer to keep it that way because it helps prevent a recording from getting stale. This battle reminds me of David vs. Goliath. The Julieta Venegas version of "The Ribbon in Your Hair" is more intimate while Denise Gutiérrez is surrounded by a gazillion piece orchestra. In this case less is more. My ears tell me that Julieta's version has more flair, more fire and more pizzazz. She is also a treat for the eyes and I am not about to hate on her just because she's beautiful. Julieta won me over with her performance and earned my vote in your battle. Shady, I rarely sing along to songs and prefer to just groove with them. Not always the case, but definitely how it is if I can't understand the lyrics. Julieta Venegas has a lot going on for her in looks as well as talent. I listen to different types of music, but when I need to wrap myself in comfort food (or comfort sounds, I guess), nothing beats early Seventies prog rock. I can disappear down the rabbit hole of Gabriel-era Genesis for days. I like the 2014 Denise Gutiérrez version of the song best. The live percussion instruments adds a dimension to it and slowing it down a bit adds an emotional punch. Nasreen, I like your musical taste. I was a bit of a late comer to the earlier music of Genesis and I agree that it is some pretty fine stuff. The shut out is over with a first vote coming in for Denise. Great battle, Lee! I agree that the music is more important than the lyrics but would also add the importance of vocal tones. Both of these women have excellent voices, which makes it harder. Like you, I didn't care for the intro to Julieta's version, but she won me over, in the end. More energy and pizzazz! Please give my vote to Julieta Venegas. Debbie D., yes vocal tone is a big factor, I agree. Glad you gave Julieta's version a fair chance. It took me a couple of attempts to actually get through her version and actually appreciate it. A vote for the energy of Julieta. Both versions of the song were fantastic, and both Julieta Venegas and Denise Gutierrez have great voices. I preferred Julieta's, because I thought it moved much better and was more consistent. We weren't moving back and forth between styles, between orchestral and Mexican as we were with Denise's. I just enjoyed it better. In general, the voices blend in with the music and become another instrument. I can listen to a vocal or instrumental version of a song and get the same experience; I don't need to hear the lyrics to get enjoyment, or, in the case of listening to songs in different languages, understand the lyrics. Often, I listen to the "Paris Cafe" station on JazzRadio.com, even though I can speak barely enough French to do an impression of Pepe LePew; I just enjoy hearing the music, and, as I said, the voice is just another one of the instruments. As for my favorite orchestral collaboration with a pop act, I thought the album by Procol Harum with the Edmonton Symphony Orchestra was superb. John, "The voice is just another one of the instruments" is a great way to described it. That's pretty much the way I see it. The Procol Harum recording was the first one that came to my mind as well. "Conquistador" was a successful hit for the band and the album is pretty much a classic. The Nice had a good one also with Five Bridges Suite. I pretty much enjoy just about anything that is heavy on percussion -- including, of course, Mexican music. And, heck, born and raised in Lost Angeles, I was exposed to a lot of it and early. I liked BOTH of these recordings and listened to each one twice before deciding. Obviously I did not allow this to factor into my musical decision, but that first video was not doing Julieta's song any favors. Horrible video. And although I find Mexican women the sexiest, I guess I'm the odd man out this time when it comes to her looks. Meh. At first I thought I'd vote for Julieta because Denise's version seemed rather tame by comparison... at first. But by mid-point in the song I was picking up all the neat textures that added so much to the recording. I listened to both again and decided that Julieta's has more fire but seems a bit one-dimensional (well, maybe two-dimensional) compared to the multi-dimensional version by Denise. STMcC, well, Julieta ain't bad and she's got a lot of talent so that's another plus in her favor. The video is a bit strange in its content, but I guess it makes for one interpretation of the song. The version by Venegas has more general commercial appeal I'd say, but I hear what you're saying about the other version. I am definitely a music-first person! I love world music and have collected music from many different cultures. This is wonderful and, frankly, it's hard to choose but I do love the first of the two. Kathleen, I'd probably enjoy browsing your music collection and listening to some of your favorites. I also have an eclectic collection that showcases many styles of music from a wide range of cultural influences. I prefer the second version: Los Angeles Azules, even though it may be a more commercial version. It has more of the traditional Mexican flavour, IMO. I got turned off by the visuals of the first more than the rap intro. DG, the visuals are a bit controversial or iffy, but the story seems to be told from the point of view of a writer composing a film script so I thought that might be of interest to the writers in the audience. I'm not sure about that film though:) I get what you're saying about that video though. I actually adore music in foreign languages, and since English lg music has been so crappy in recent years on both sides of the ocean, I've turned to French singers, even some Spanish, Latin, Romanian, Greek and Turkish ones, not to mention the Russians. They seem to have retained what music actually is in their songs, both rhythm and lyrics, not to mention their videos. Can't remember now any of the orchestral songs, but I adore me the mix of pop and operatic singing, the last one to win my heart over was Nicole Scherzinger helping Will I Am in his new song 'Mona Lisa'... she was amazing. Dezmond, there is a wide world of music to be enjoyed and often I think Americans don't even venture out into that world because it all seems strange to them. I checked out "Mona Lisa" and I agree it's a pretty cool concept. Nice juxtaposition of styles as well as songs. I'm not very versed in Spanish, but I found both examples to be very nice. I lean more to preferring Julieta Venegas's version. A great BOTB to lead off September! Pop Tart, I don't think knowing a language is essential to enjoying the song. Suzanne, glad to hear you're still making the A to Z rounds. My parents said that when I was a toddler, I would gallop around and around the diningroom table singing along in perfect Spanish to my dad's Los Indios Tabajaras albums. I can sing a long to La Bamba now and that's about it. Fave pop group with orchestra is of course ELO!!!!! And the Grateful Dead did their beautiful 'Terrapin Station' song w/ an orchestra and choir for the album. First time I heard it I was so blown away I had to listen to it again. JoJo, kids can pick up languages much better than adults. Songs are not a bad way to get accustomed to a language. I didn't recall how "Terrapin Station" sounded so I went to YouTube. This is a song and album that I never listened to very much so no wonder I don't remember it. Sounds nice. This is a really nice song. I liked the first version best, Julieta Venegas. So please give her my vote. I wasn't turned off by the beginning of the song, like I thought I might be. Michele, I never really gravitate to lyrics in different languages since I don't know what they mean. Sometimes English lyrics might draw me, but it's mostly the music. The first gets my vote, way more catchy I found. I may not be able to understand the lyrics, but still enjoyable. Only turn off for me is when a song makes my head hurt, i.e. all head bashing crap, then I don't give that the time of day. Pat Hatt, I don't listen to music in order to get a headache and when I have a headache there's not much music I can listen to. This is kind of a tough one. Both were pleasant enough, but neither grabbed me a whole lot. I think though, I liked the first vocal better- don't really know why. If you'd have switched vocalists, I would have took #2 for the orchestra. But, as it is, #1 for me. CW, this contest has definitely trended in one direction. Cathy, interesting thought about evil lyrics. Mostly I guess I couldn't tell if lyrics were evil or not unless the music itself emanated an aura of evil. But then again there is the consideration of what is evil. Much of what we listen to in pop music can be construed as "evil" by certain people. Something interesting to consider. Sorry I ate all the quacamole for lunch and I'm clean out of salsa. I really like Denise Guitierrez because of the orchestra and her velvet voice. I guess I like traditional more. Birgit, maybe there'll be a comeback here. Mike, She needs more votes! I've loved music all my life as you may well know, all genres appeal to me having been through the classical, rock'n' roll and pop stages. My vote goes to Julieta Venegas, all of the singers are unknown to me but there was something about this one that had that "Extra Something"
Yvonne, as long as you make it before the day when I tally votes you're not late. A vote for the "extra something" of Julieta. I love the rhythm of some Spanish music. It's the beat that entices me to listen further. Although rock/heavy metal music hurts my ears and so I avoid it as much as possible, which can be difficult when my husband blasts it out from his office :) Great musings, Arlee. Nicola, I've got to be in the right mood for heavy metal and it does happen sometimes. Julieta certainly has the moves! But it was too hip hop for me. Energetic yes. Denise gets my vote along with the orchestra. Susan S, the hip-hop aspect was what initially turned me off with Julieta's version. Although I liked the second video with the orchestra, choir, band and its choreography, it failed to move me - too neat and...choreographed. It lacked the energy and soul of the version by Julieta Venegas. I vote for the rawness and passion of Julietta. Roland, the orchestral version is indeed a production. A vote for "rawness and passion"--Julieta. Lee, I had a big surprise here. I didn't expect to know the song... there's a restaurant near my home and I recognized it. Wow!.That said, what a tough choice, and I might end up in the minority. Denise Gutiérrez and group were very entertaining but I think I liked Julieta Venegas a bit more... including the hip-hop! Show my vote or her, please. Dixie, glad to hear that the song is being played in other places. Not sure you'll be in the minority with your vote. Interesting battle again. Stuff I've never heard, of course. I'm with Dixie on this one. I like Julieta. I like her voice better, the arrangement better, and certainly her looks better. She is more than a "MEH," as McCarthy claimed. SBB6, Julieta is not a "meh" in my opinion either and she's got talent to go with nice looks. It's another vote for Julieta. I tend to get lost in the music and sometimes my mind just shuts out the lyrics. Oft times I have to hear a song multiple times before I realize the lyrics. To me, music is about emotion and passion. I prefer Julieta's version of this song. Please give her my vote. Mary, I'd agree on the emotion and passion aspect of music. The lyrics are an added dimension that gives a listener more to think about. I love all the Spanish-language songs I'm encountering in this battle. I like the first rendition very much, but I vote for Denise because I love the orchestra. Janie, I think Spanish language songs and Spanish language artists are mysteriously in the air in these rounds of Battles. I really liked the original the best. Julieta didn't impress me, but she did have the energy that was sorely lacking in the orchestra version. I love orchestras as a rule so perhaps it was Julieta's authentic style that drew me back to her. I have trouble listening to music when I don't understand the words. It's not the words that draw me, but it is the words that speak to me. I listened to all three and found that I liked the Julieta Venegas version best. Fun BOTB. Thea, I get what you're saying. Sometimes a song will appeal to me and as I listen more to the lyrical content I begin to connect even more--or in some cases feel a disconnect to where I might not like the song as much. I prefer the Julieta Venegas version. It feels more upbeat and energetic, with a better pace. I love listening to songs in other languages. I particularly like monastic Latin chants and songs, as well as Orthodox Christian religious music in various languages. There's a beautiful musical rendition of the Our Father in Georgian, "Mama Chveno." Interestingly, in Georgian, the words for mother and father are switched from how they are in Indo–European languages, so Mama is father and Deda is mother. Carrie-Anne, if I don't understand the language then my focus is on the music, but that's even the case when I do understand the language. For me the music is what matters most. Lee, Hope I got here in time. My vote goes to Denise. I like her voice and the instrumentals better in her version. Julie, I'll add your vote to the tally, but it doesn't help Denise win. But I thank you on her behalf. Yippee-Ki-Yay! Another Flash Back Friday!